The Rubbermaid 1809375 self-wringing twist mop is made of a blended yarn that absorbs more liquid and has better floor coverage than cotton. Unlike cut-end mops, this unit’s long, looped ends resist fraying and capture most debris. Its twist-handle wrings water without wetting the user’s hands, and the double tailbands prevent tangling. 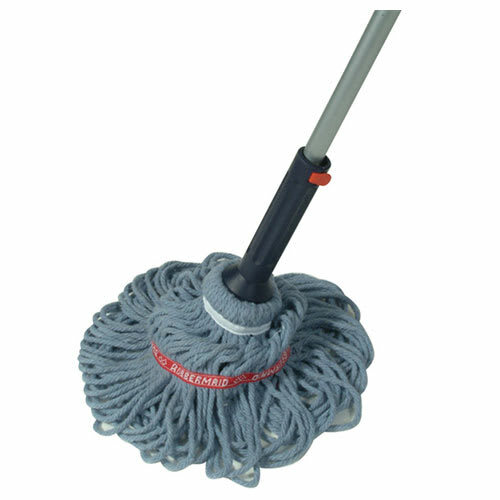 To learn more about mops, check out our mop heads guide. "My wife and I use this style mop to keep our home clean. We have pets and have to keep cleaning to keep things good for our pets and us. This sty..."
"In general the mop is good but I'm on my 3rd mop because they rust out inside the plastic covering over time and your left to buy another one bec..."
"I've had this product for about a month. This is the second one I have purchased within 5 months. The whole thing fell apart. I put it back toget..."
We love this product (mop) for keep our home clean. "My wife and I use this style mop to keep our home clean. We have pets and have to keep cleaning to keep things good for our pets and us. This style mop is so good, it is hard to find." "In general the mop is good but I'm on my 3rd mop because they rust out inside the plastic covering over time and your left to buy another one because it can't be repaired.. So I think I'll go back to the old fashion mop unless they use better durable material in the future"
"I've had this product for about a month. This is the second one I have purchased within 5 months. The whole thing fell apart. I put it back together and it lasted till I mopped my whole floor. Then the part where I'm suppose to tighten it to wring out my mop broke. So it no longer tightens the way it's suppose to. Sometimes it works and sometimes it doesn't. And today I was using it to the tighting part let loose and caught my pinki finger and tore off my skin. I'm so upset right now. I've never had such issues with a mop before till I purchased this product." "Like any mop, it means routine WORK. Mop best to squeeze I know. Understand Ted Moss designed thus before his company bought by Rubbermaid. Good but seems pricey."